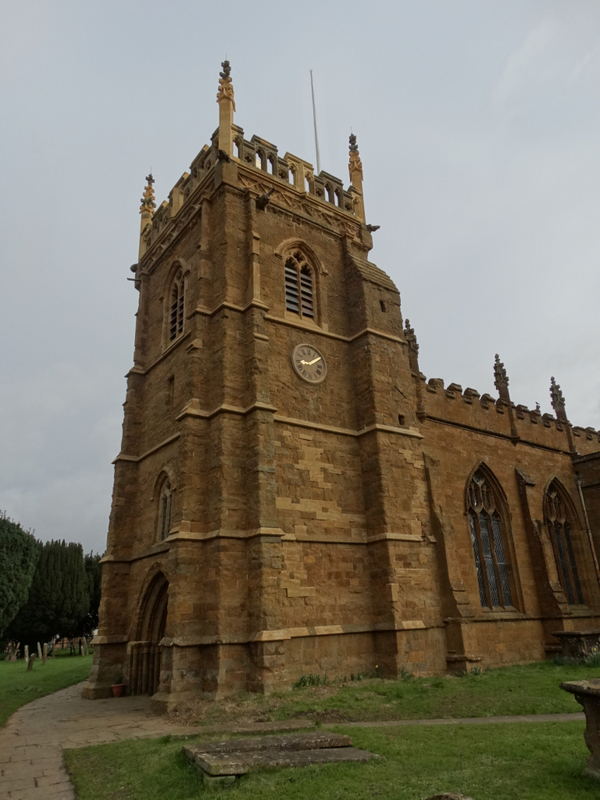 We stopped at St Peter’s church, in the middle of the village of Kineton – SP335511 – en route to the Bloxham Festival. 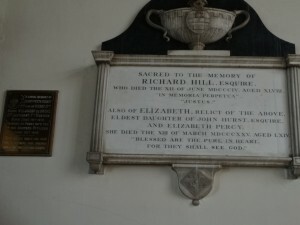 It is in the Diocese of Coventry, in the county of Warwickshire. 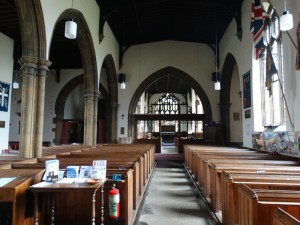 It looks a very lively church – good website, facebook and twitter – lots going on, well cared for, open and loved. The website says it was their 700th anniversary last year, but that is the only mention of the history of the church on their website. The only guidebook I can find is a 1983 one on sale on Amazon. 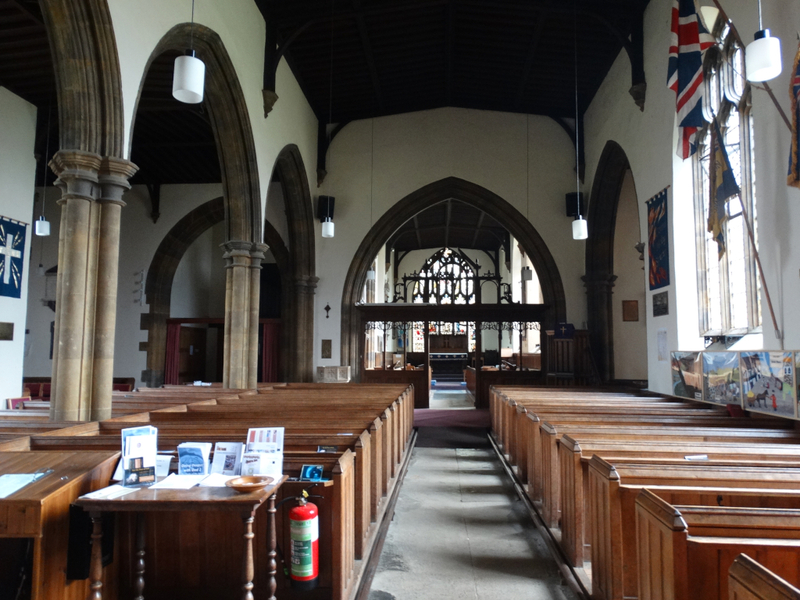 It is not one of the Betjeman churches (see my last but one post for details of their app), but British Listed Buildings – gives some information. 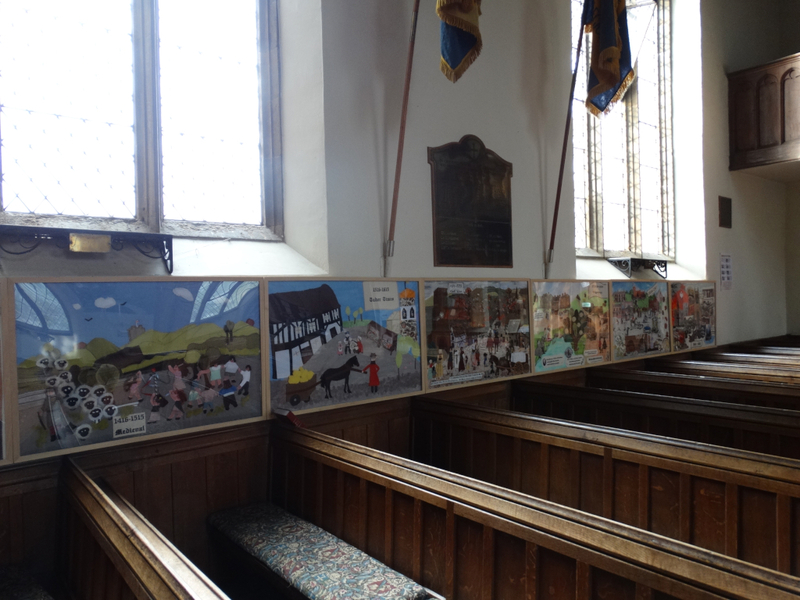 There are some history panels in church, so I will use some information from there. The village has a very active Local History Group and their website includes a history of the village. Their Christmas meeting was an exploration of Christmas Carols, they have recently mapped the churchyard, and their website includes various short articles on church history. I picked up a battlefield trail – the Battle of Edgehill took place just down the road on 23 October 1642 – so there must be some tourist money knocking around to produce a decent guide. There is a battlefield website. 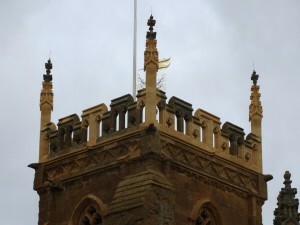 Come on good people of Kineton – can you get a guidebook produced before the 702nd anniversary? O Lord, thou knowest how busy I must be this day. Here is a web page about Sir Jacob, and his portrait. He was born at Melton Constable in Norfolk – later the Works for the Midland & Great Northern Joint Railway, a wonderful railway. 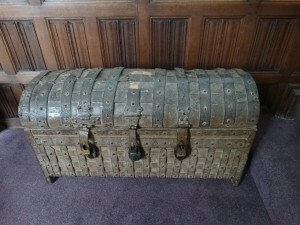 Apparently he began his career as a professional soldier at the age of eighteen, under the second Earl of Essex and Sir Walter Raleigh on the Azores expedition of 1597. He served in the Anglo-Dutch brigade under Prince Maurice of Nassau and gained a commission after fighting against the Spanish at the battle of Nieuport in 1600. Around 1619 he married Agnes Impel, a Dutch heiress, then in 1621 joined the household of the exiled Elector Palatine and his queen Elizabeth of Bohemia. He gained further military experience in Flanders and Germany during the Thirty Years War fighting in the Dutch service, under Christian IV of Denmark (1626-7) and under Gustavus Adolphus of Sweden (1629-32). 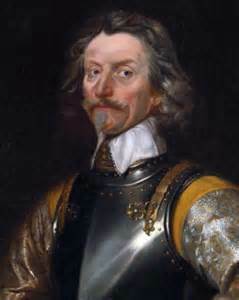 In 1639 Charles I asked him to return to England and appointed him Sergeant-Major-General of the army sent to fight the Scots. He commanded the infantry at the battle of Newburn – which took place just down the road from Ponteland – but escaped all blame for the English defeat and for the subsequent capture of Newcastle by the Scots. In August 1642 he joined King Charles at Nottingham and was appointed commander of the Royalist infantry on the morning of the battle of Edgehill. He continued as commander of the Royalist foot throughout the First Civil War, and was created Baron Astley of Reading in November 1644. His infantry was routed at the Battle of Naseby in June 1645, but the King appointed him commander of the Royalist forces in Wales. In March 1646 he set out from Worcester intending to march his troops to the King’s headquarters at Oxford but he was intercepted and defeated at Stow-on-the-Wold by a superior Parliamentarian force and obliged to surrender. Astley was imprisoned in Warwick Castle until the surrender of Oxford in June 1646. Later he lived quietly in retirement at Maidstone in Kent, but was arrested and briefly imprisoned when Charles II and the Scots invaded England in 1651. He died at Maidstone on 27 February 1652 and is buried in All Saints Church, where there is a memorial to him. I can find no biography, so here is a Civil War story my wife can research. Maidstone is a town I have never been to (I have been through it, but never got off the train). I must go and do so. Surely his story and his faith are worth recording. The tower has had some recent stonework repairs – it looks a very good job. Some nice photos here. The stone is a lovely colour – it had looked especially gorgeous when we had driven past in bright sun the previous day. 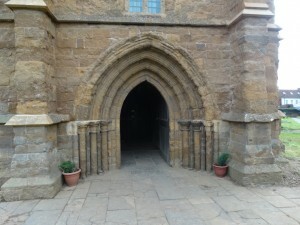 I love this west door, it invites you to enter. The tower itself dates mid C13 to C15, the rest of the church was rebuilt in 1775 and remodelled a century later. The village dates back to Bronze and Iron Age, and the Roman Fosse Way runs very close. 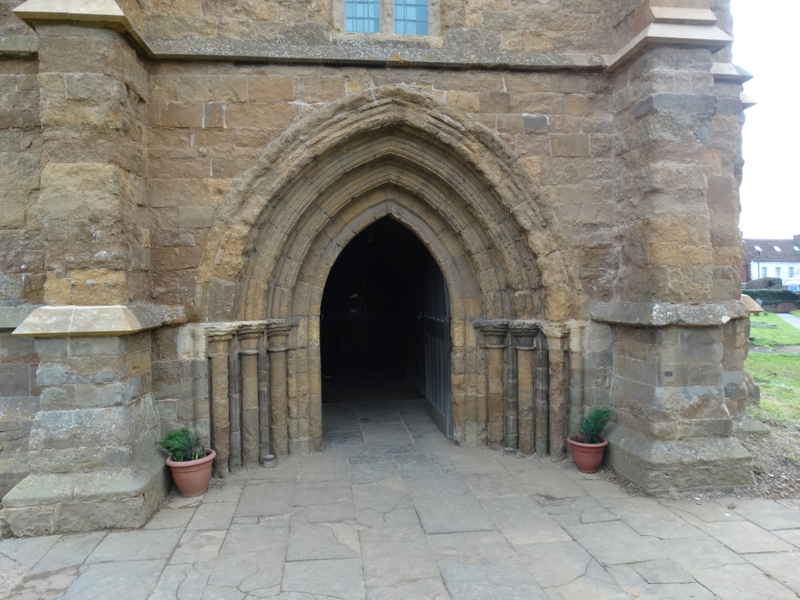 There was a Saxon church at Chadshunt, just down the road. There is a Saxon charter of 969 from King Edgar to a nobleman called Alfwold giving land in Cynton (=King’s settlement/farm). The grant shows that the land was owned by the King and possibly contained a village. 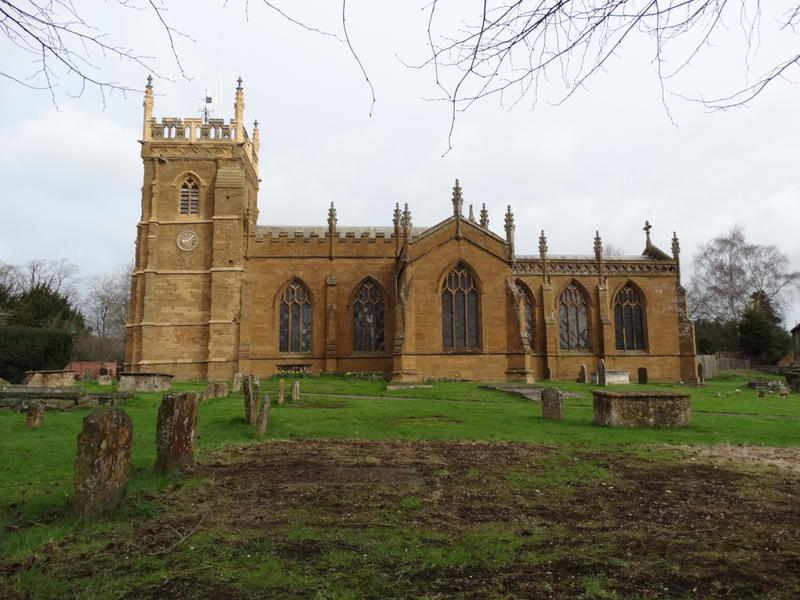 By the time of the 1086 Domesday survey, Quintone, as Kineton was then spelled, was still owned by the King (one of only nine royal holdings in Warwickshire). In the early 12th century King Henry I gave the Church of St Peter and land in Little Kineton to Kenilworth Priory. 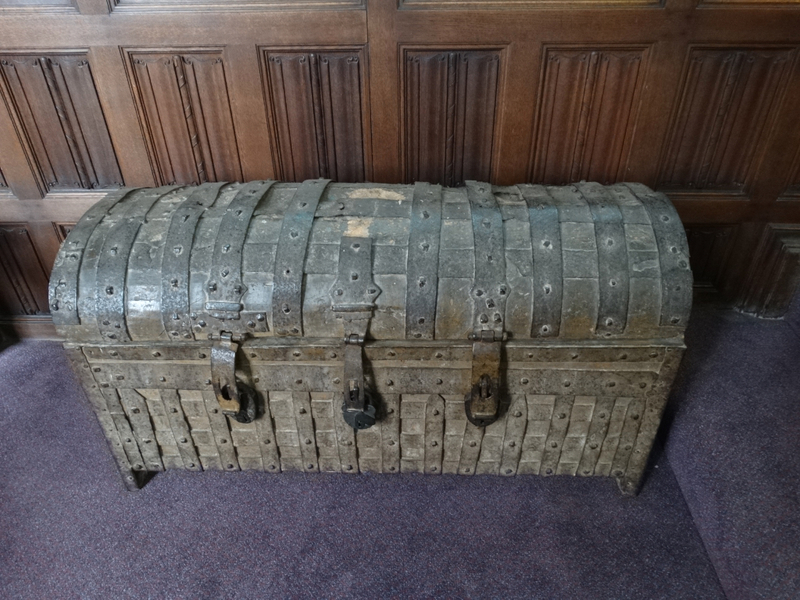 I should imagine that this chest has seen a great deal of history, and stored many wonderful documents. 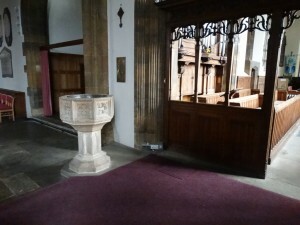 The font has been moved to the front. I understand all the good reasons for doing this, but it seems a shame we lose the link with the entry into church. 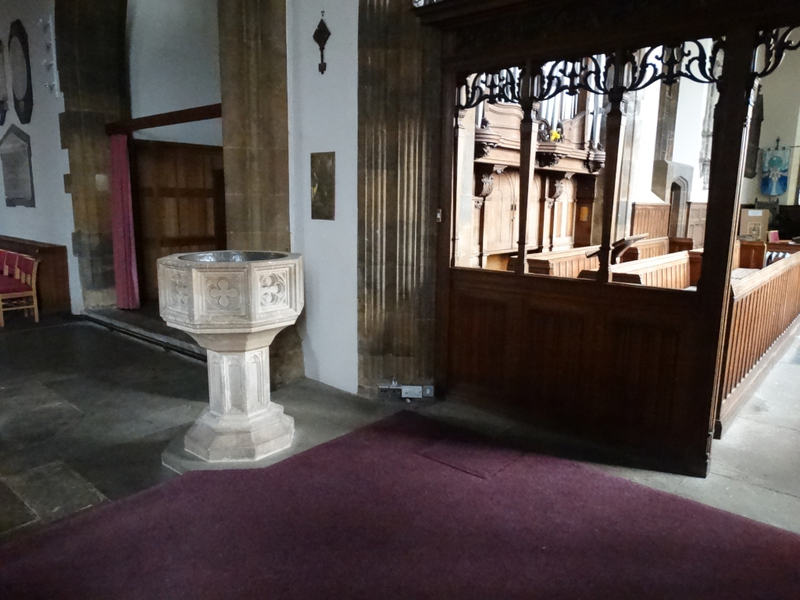 I think it is a Victorian font. 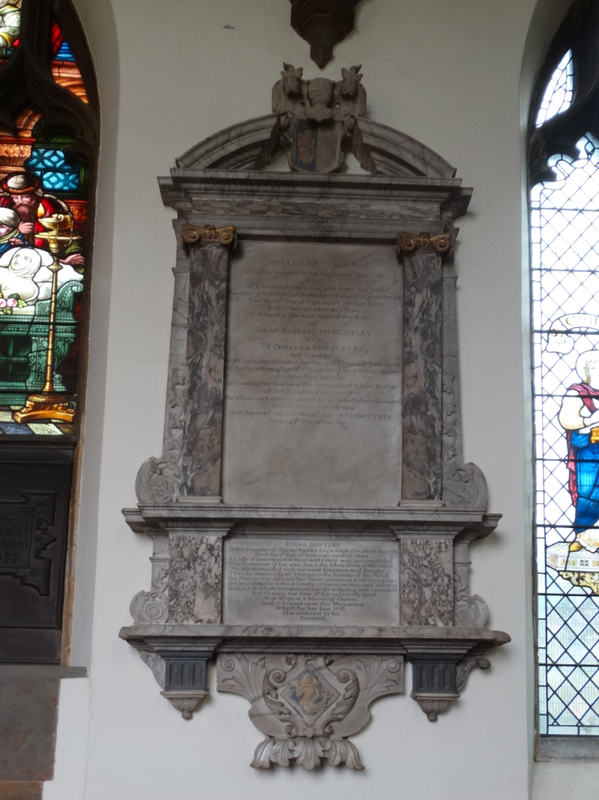 I liked this memorial to Richard Hill and his wife Elizabeth, and this is quite a stunning one to Charles Bentley and his wife Sarah. I had a smile at the line about Sarah “She was by her husband the virtuous and tender mother of five daughters and one son.” If she hadn’t become a mother by her husband I could imagine she wouldn’t have got such a large memorial tablet. 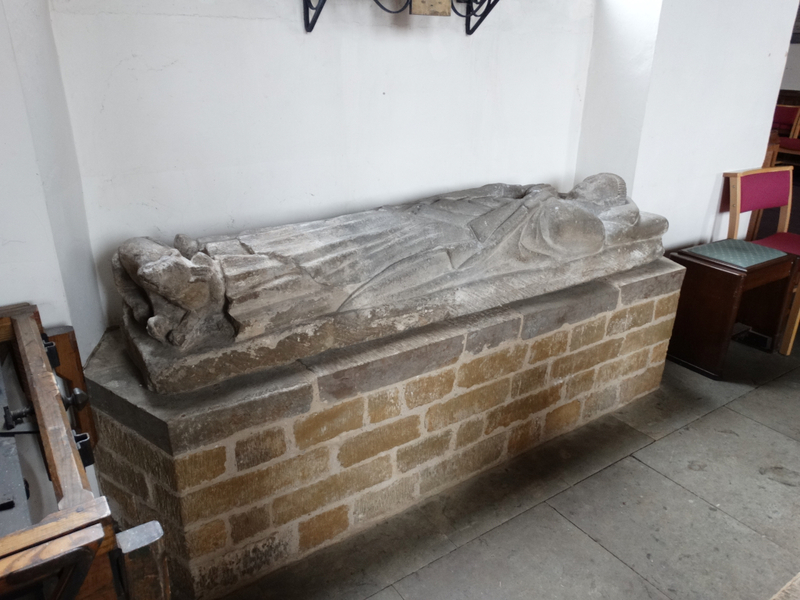 There is a late C14 effigy of a recumbent priest – I like being a recumbent priest (he says, lying on the sofa typing this blog). The glass is Victorian. I like the thurible in the first one, and the raising of Jairus’ daughter in this one. You may remember that Mark’s gospel records that Jesus said “Talitha cumi”, Little girl, get up. James Atwell, my old boss, told a lovely story of when he was on a bus in Jerusalem. As it came to a stop, the lady in front of him said to her daughter “Talitha cumi”, Little girl, get up. 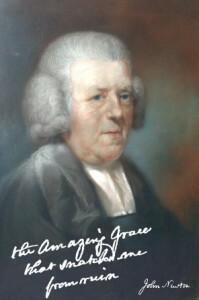 In 1772 John Newton wrote “Amazing Grace” while staying in Kineton. Born in 1725 he was in the Navy, then was the Captain of a slave ship. 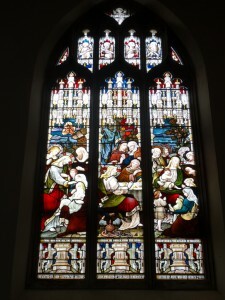 It is so hard to get our heads round the fact that a man striving to find Christ was willing to captain a slave ship. He found his “amazing grace” after handling the ship, the Greyhound, through a violent storm in 1748. 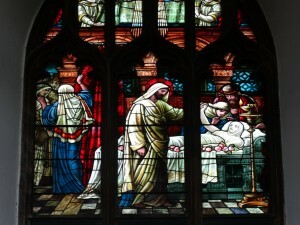 Later he was influenced by the cleric William Cowper, and was ordained. His friendship with Cowper (the poet who gave us the phrase “God moves in a mysterious way / His wonders to perform”) led to a spiritual collaboration that completed the inspiration for “Amazing Grace.” The lyrics are based on 1 Chronicles 17.16-17, a prayer of King David in which he marvels at God’s choosing him and his house. Newton apparently wrote this for use in a sermon he preached (presumably in Kineton) on this passage on New Year’s Day 1773, and for which he left his sermon notes, which correspond to the flow of the lyrics. Another story for their guidebook!